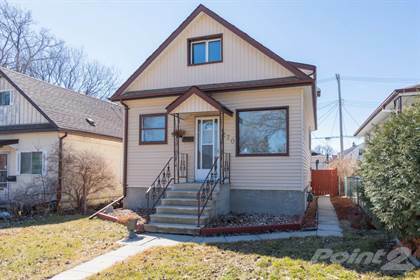 I am interested in 17 Vivian Ave, Winnipeg, MB. 17 Vivian Ave is a 1400 square foot House for sale in Winnipeg, MB R2M0E5. It has 4 beds, 1 baths and was listed on Ovlix.com since April 15, 2019 by Re/max Executives Realty for $284,900. Listing agent: Sherri Baldwin. The average price for similar 17 Vivian Ave real estate listings - $225,688 which is 46% lower than $414,767 for Winnipeg, and 40% lower than $378,485 for Manitoba. Comparable nearby homes are: 1009 Talbot Ave, 438 Neil Ave, 1701 323 Wellington Cr, 1086 Burrows Avenue, 74 Humboldt Avenue. What's near 17 Vivian Ave, Winnipeg R2M: Maison Gabrielle-Roy, Churchill High School, The Forks, Winnipeg, City of Winnipeg Act, Fort Rouge (fortification), Le Musée de Saint-Boniface Museum, Sydney's at The Forks, Saint-Boniface Museum, Saint Boniface Cathedral.